This article I wrote appeared on The Catholic Thing web site on August 24, 2011. 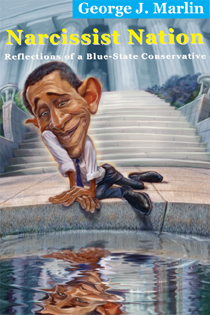 Check out George Marlin’s new book Narcissist Nation: Reflections of a Blue-State Conservative. People interested in a good summer nonfiction read should pick up a copy of the bestseller, “Reckless Endangerment: How Outsized Ambition, Greed, and Corruption Led to Economic Armageddon,” by Gretchen Morgenson and Joshua Rosner. Morgenson, a Pulitzer Prize-winning New York Times business news reporter, and Rosner, an expert housing and mortgage research analyst, have penned a fascinating no-holds-barred story about those responsible for the mortgage meltdown that caused the greatest economic downturn in America since the Great Depression. The seeds of destruction were planted by Bill Clinton in 1994, when he announced that the U.S. government was determined to “expand the American Dream” by increasing the number of homeowners across America. To implement his policy, Clinton turned to Fannie Mae, a New Deal creation that has supported the housing market by purchasing mortgages. Fannie Mae, which was privatized in the 1960s and since 1981 has issued and guaranteed mortgage-backed securities, maintained the false image that it was still a government-backed organization because it was exempt from disclosing financial data and executive salaries, from paying taxes in the District of Columbia and some board members were appointed by the president. Fannie Mae, “Reckless Endangerment” documents, “led the way in relaxing loan underwriting standards.” Down payments of 20 percent and income verification were eliminated. Lending institutions were told to approve mortgages in a more “democratic” fashion and to expand creative financing and to simplify the home-buying process. The authors persuasively argue that James A. Johnson, CEO of Fannie Mae (1991-1998), “not only opened the door to the mortgage meltdown [but] virtually guaranteed it.” A master at public relations, political lobbying and fundraising, he manipulated Congress to eliminate government oversight of Fannie Mae even though it accepted government subsidies. The Federal Safety and Soundness Act of 1992, which had Johnson’s fingerprints all over it, actually encouraged unsafe and unsound Fannie Mae activities, permitted it to design its own regulations, eliminated oversight and accountability and required it to meet the needs of “low income and underserved families.” The 1992 act set the stage for Fannie Mae to buy from lending institutions around the nation risky loans that were likely to default. Well, it did happen and in a nutshell here’s how: After buying tens of billions of subprime mortgages from banks and mortgage lending institutions, Fannie Mae bundled them and sold them to investment banking firms (e.g., Goldman Sachs) who procured insurance guarantees and AAA ratings from Moody’s and Standard & Poor’s. The investment bankers then sold these toxic securities to unsuspecting individuals, mutual funds and bank investment portfolios. Unloading these subprime mortgages to various investors was merely a reshuffling of the chairs on the deck of the Titanic. When the real estate bubble burst and the housing market collapsed many financial institutions – like Long Island’s now defunct American Home Mortgage Investment Corp. – and insurance companies on the hook, bellied up and threatened to take down the entire financial system. This article I wrote appears on The Catholic Thing web site on August 10, 2011. Mayor Michael Bloomberg, who acts as though the power to mandate proper behavior was his by birth, is another major advocate of laws to force New Yorkers to live by his standards. In his campaign to ban salt, Bloomberg compared it to asbestos in schools. “Salt and asbestos, clearly both are bad for you,” he declared. The mayor has also requested the U.S. Department of Agriculture to forbid food stamp recipients from purchasing sugared soft drinks. A law that imposes a “fat tax” on junk food. Brooklyn Sen. Carl Kruger called for a ban on the use of cell phones, MP3 players and BlackBerrys while crossing New York City streets. The senator complained users of these devices were “tuning out the world around them.” Kruger has since been indicted for taking bribes. In May, do-gooders in the New York State Department of Health declared war on playgrounds. It issued a list of children’s field games that posed “a significant risk of injury.” Freeze tag, dodgeball, kickball, red rover, capture the flag and Wiffle ball were placed in the dangerous category. Playground overseers that permitted these games were ordered to acquire state permits and provide on-site medical supervision. Thanks to massive protests, the governor ordered his health department to chuck the new regs. Nanny State ideologues are reminiscent of the ancient Gnostics who believed they possessed exclusive knowledge about reaching perfection in the temporal world and could establish with scientific precision an environment that would produce perfect harmony among men. Like the Gnostics, Nanny State elites claim to love “mankind” but have contempt for ordinary persons and their lifestyle decisions. Hence, they want to impose laws and regulations that will force the masses to adhere to their vision of a healthy, safe and wholesome society. Historian Richard Hofstadter best described such enthusiasts as “totalitarian liberals” employing illiberal means to achieve so-called liberal reforms. Better social engineering utopians than New York pols have failed in their quest for earthly perfection. It’s time for them to stop. This article I wrote appeared on The Catholic Thing web site on July 27, 2011.